Have you ever wonder how known SEO practitioner thought about how to top Google SERP ? , I believed that the picture shown below will give you an idea on how to top the search in addition to the post I made just a while ago regarding In Content Links . Google Algorithm is really top secret but at least we have guides as shown below from the experts in this field. Trust Authority of the Host Domain got the highest percentage among others. But I think they forget to mention about the research part of SEO. It is hard to do SEO if you don’t research on what you are doing. So you better allow some percentage for the research . How much I don’t know. But in General I think I agree with the content of the Google Algorithm picture above. And I saw that some of that factors is not part of my strategy , so better apply it and have a better Search Engine Ranking ( SERP ). 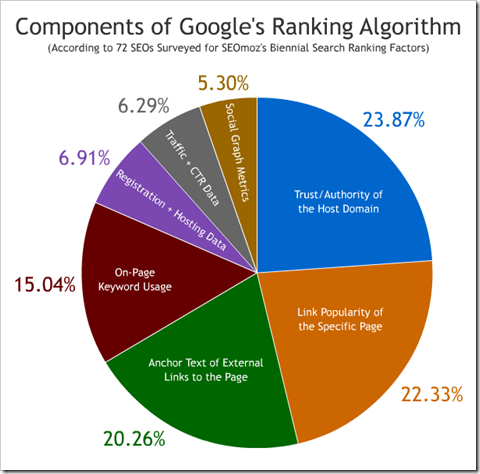 Great article and easy to understand Google algorithm diagram. Another point is “Total posts of a blog”. I have seen a blog with thousand posts with 6 months old age only can easily beat a normal SEO optimized personal domain owner blog. Because above diagram won’t work without many quality contents. In a way yes , but there are also niche blogs that rans well in SERP even they have only few contents. @Dexter Panganiban, So very true. Honestly, it really depends on the niche and how they handled their linkbuilding. The content may or may not be a huge factor, depending on the niche that you’re targetting, I think. I must agree.. content really target your possible long time reader.. but if one just want money for a particular day as an example is the fight results , MMA results etc.. it is usually full of keywords only and not with content…. So trust/authority of host domain is the biggest factor followed by link popularity… Maybe I’ll stick on blogspot blog(own by big G)! Yeah, that’s true.. seen some older blogs (3-4 yrs) and they have higher PR (from G & Alexa) even if there’s not much contents on it. yeah, not only high in PR, but some of them are also high in the SERPs.